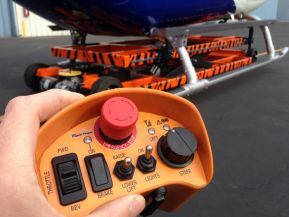 Welcome to Tiger Tug helicopter tugs, a new concept in moving helicopters around safely and efficiently. 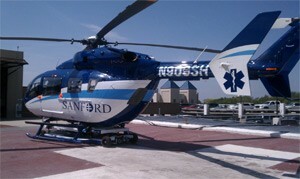 There are several choices available in the market to move helicopters. Most of them are using technology that is quite old and not very efficient. We took a fresh look at the tug market and interviewed people using other tugs like Heliporters®, Tug a Lugs, Heli Tow Carts, Helicopter Dollies, etc. and asked what they liked and didn’t like about their tugs. From there we set out to design a vehicle that was safer and easier to use. It was important for us to go beyond what has been the industry norm and create the next generation of helicopter mover! 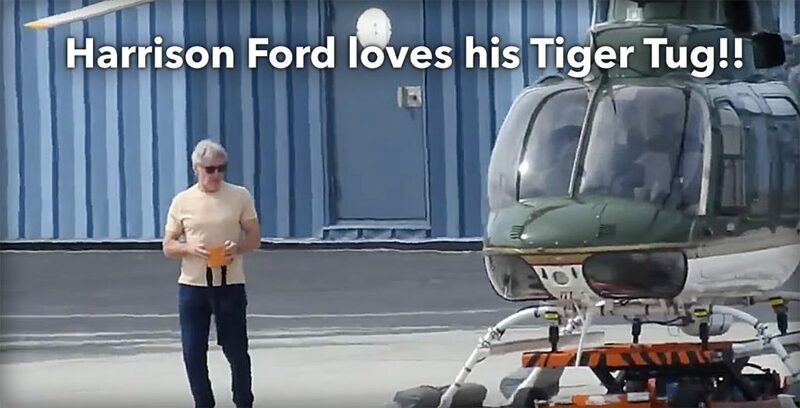 “After decades of using helicopter platforms and competing lift products, I saw a Tiger Tug under a friend’s Bell 407 in Santa Monica. It was obviously a better mouse trap, but one had never been built for a low-skid Bell 427. Mate, after owning another well known brand helicopter tug I can’t believe how good the Tiger Tug is. It is so easy to use, both extremely stable smooth in operation and I feel a lot more confident using it and a lot less risk of damage to my Heli. Every one at Mascot Sydney is amazed and in envy. The only problem I have with it is that now it has made trying to sell that other tug yours replaced to anyone- impossible!! …And yes even the Orange Tiger paint job will amaze you! Thank you Tiger Tug for this great piece of equipment! Where I live in Sweden we get a lot of snow. Besides my EC 120 and AS350 I have a Citation Jet which I move around with a Lektro electric aircraft tug. It gets stuck in the snow and ice quite often. To avoid this situation I ordered the snow chains option with my Tiger Tug. They are still in their original container as I haven’t needed them. My Tiger Tug easily handles the heavy snow we get here without any problem. With the weight of the helicopter it just powers right through it. On rainy days I send the Tiger Tug with my helicopter on its back out of the hangar, out on to the ramp, drop off the helicopter and have the tug return while I stay nice and dry. Then at my convenience I can make the dash out to the helicopter. Easy solution for inclement weather! I am very pleased with my Tiger Tug and after investigating the whole market for helicopter tugs I purchased a second one for my other hangar location. I think Tiger Tugs are a very safe and problem free investment! I had been looking for a suitable helicopter tug for years. I finally decided on the Tiger Tug after a recommendation from my helicopter sales person. From the start I received great response and superior customer service even though I am on the other side of the world and very different time zone. My Tiger Tug operates extremely smooth and the finish is perfect in every detail! The only regret I have is that I didn’t buy it years ago! 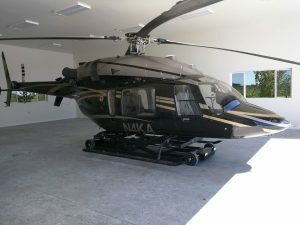 Every time I take my AS350B2 out of the hangar it puts a smile on my face! Paravion® and Heliporter® are registered Trademarks of Paravion Technology, Inc.